I really like this car. The text on this story might end up being somewhat longer than normal, but I think it is worth it. Enjoy! Information from NCRS indicates an official shipping date of March 22, 1967. This car was sold new at Willapa Harbor Motors in Raymond, Washington. The trim tag shows it was built 3rd week of March 68 at the Van Nuys plant. The original colors were Matador Red with a black vinyl top (Code R-2) and black deluxe interior. This car only has 40,000 original miles on the chassis, but it was wrecked early in its life. The nose of the car has been replaced with original GM sheet metal, from an SS car (swapped before Dalton received the car). The only things replaced on the suspension are the shocks. The 12 bolt axle has never been out of the car, and it still has 1967 gear oil in it! The interior is 90% original, with only the carpet and seat foam being replaced. The cars original options include: RS package, power steering, power disc brakes, L30 327/275hp engine, M20 Saginaw transmission, console, N34 wood wheel, tilt steering column, rear refroster, spoilers, remote mirror, dealer added passenger mirror. 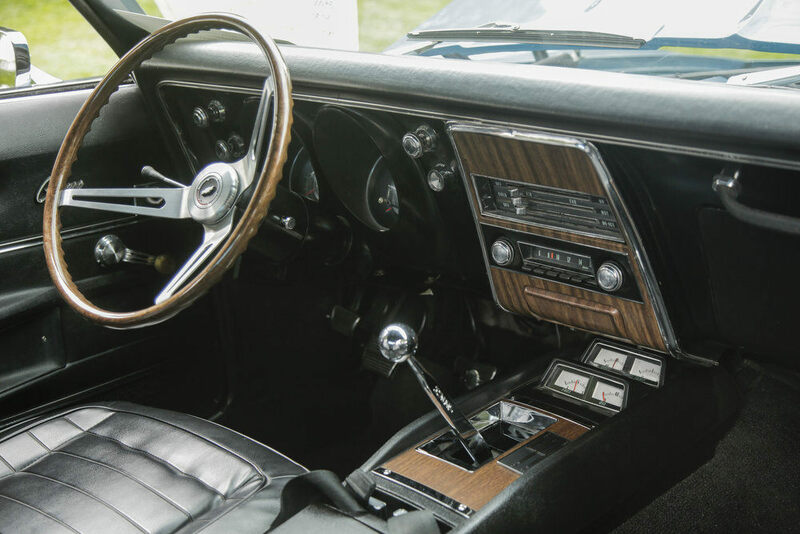 Options added during restoration include, console gauges and in- dash tachometer, space saver spare tire, rally wheels, SS badging which was added previously was kept. The color was changed color to LeMans Blue and the vinyl top was removed. The original L30 has been dressed to look like a 302 (all of the stock parts were kept and are sitting on the shelf). The Saginaw was long gone before purchase. 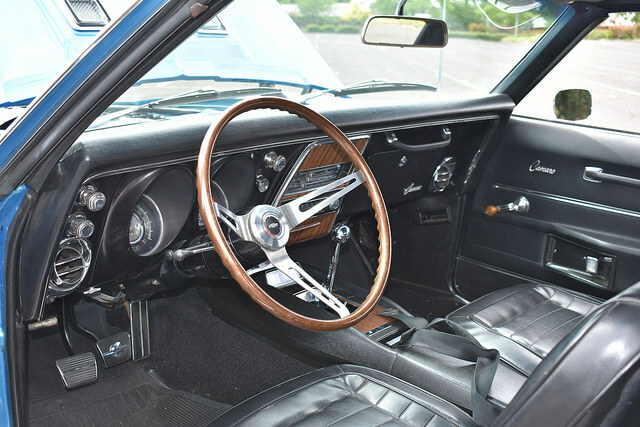 A 1968 dated Muncie M20 with a Hurst Competition Plus shifter is in its place. Here is some of Dalton's personal story on the car, mostly in his own words. 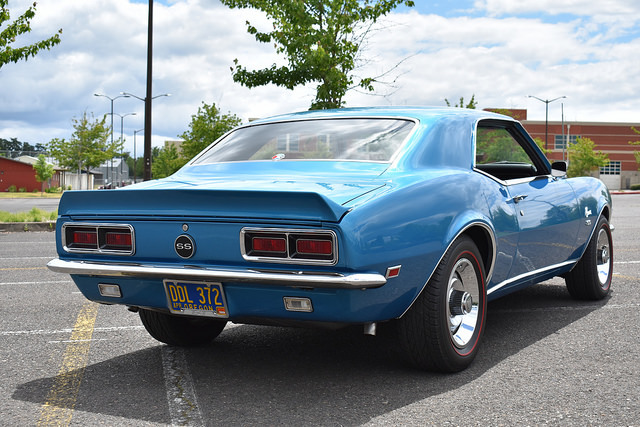 This 68 Camaro is my first car. My grandfather is a big car guy that has restored many classic Chevys and hot rods over the years. When I was about 7/8, he wanted to teach me how to work on cars and restore a car to have for myself. I have always had a fascination with Camaros. 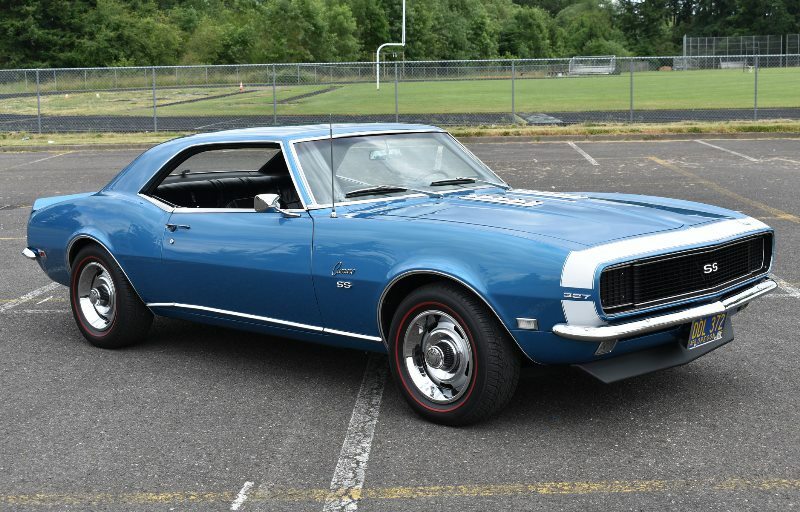 I always went to the Camaro section in any Chevy book, and was drawn to the First Gens. My grandpa had flipped a lot of them in the 70s and 80s, and he saw my interest in them. So we checked the paper classifieds to find a car to restore (this was in 1999/2000 - yes I'm a youngster at 25, lol). We had looked at a few pretty rough 67's and missed out on 3 other cars. Then this 68 popped up one morning in the paper in the middle of the week. My grandpa saw the ad and instantly took off to look at it while I was at school. The car was a rainbow of colors, with parts overflowing out of the interior and trunk. The main thing was that there was only one spot of rust on the entire car, right at the top of the a pillar at the corner. My grandpa gave it a look and saw another group coming to look at it, so he bought it right on the spot. He didn't tell me he bought it until we went to pick it up the next day after school. I still can't describe the feeling seeing that rainbow 68 with the mean RS grille staring right at me for the first time. I was hooked, with thoughts of big blocks, lumpy cams, and big ole burnouts running through my young head. My dad tagged along as well. The car ran, so we decided to drive it home in the pouring rain. About two thirds of the way home, the car backfired so hard and died, that we thought the motor blew up right there. Luckily Dad was right behind us, so we hooked the two strap up and pulled it the rest of the way home. Turns out that when it backfired, the gear on the distributor sheared all the teeth off. So the motor was pulled and then the pan was dropped. We found every tooth in the pan! Luckily the block was still standard bore and still had factory honing marks. 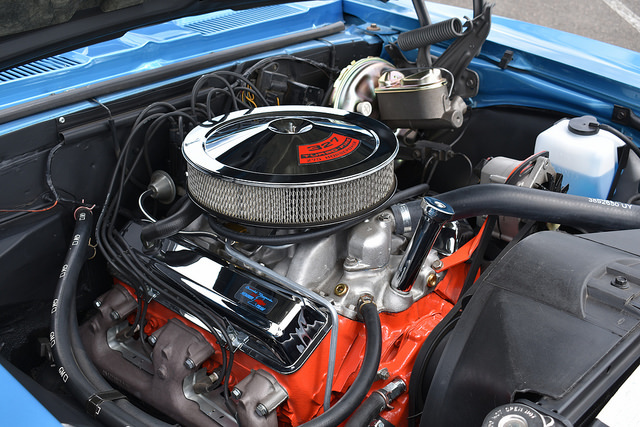 This was the first indicator that this 68 was a low mileage car. The original build plan was put a 427 in the car that my grandpa had been saving for years. I got curious about all of the numbers on the block and trim tag, so I started learning about the meanings. I got the Camaro ID code book (brown cover with the pace cars on it) and learned all the RPO codes and how to read a trim tag. During that process I realized the car still had the numbers matching motor! Even though my grandpa didn't care much about that, I thought it was neat the car still had it. So the plan changed to keeping the 327, but dressing it up like a 302. It was during this time that I also learned about the L30/M20 combo. We thought the 12 bolt and multi leaf rear springs were added in the 70s. But after a small blurb in a Camaro book about the "phantom super sport" Camaro, I dug into the car and really looked everything over. Almost all of the parts were original! My grandfather and I did almost everything on the restoration of the car, except the spraying of the color. The car was only worked on when I was at the house - when I was not at school or after school sports. I would also work for my grandpa during summers and breaks to pay off parts. He did some property development so I would paint barricades, dig post holes, plant shrubs for a retention pond and whatever else that need to be done. The car was also used to make sure my grades were good. The entire restoration took 7 years and it was finished right before I could get my permit and to take it to a car show. It was a late night that involved bleeding the brakes and borrowing the tires and wheels of my grandmas 55 Chevy Bel Air to get it to the show. She wasn't too happy to see her car on blocks! Since the car was completed, I have been slowly putting the car more correct and original - if Chevy had built a SS 327. The car has lead me to be extremely active and full of enjoyment in the local Portland, Oregon classic car community. I am also very active in various Camaro groups such as CRG (just soaking up info from the true experts) and sharing the old cars to my generation on younger Facebook pages. 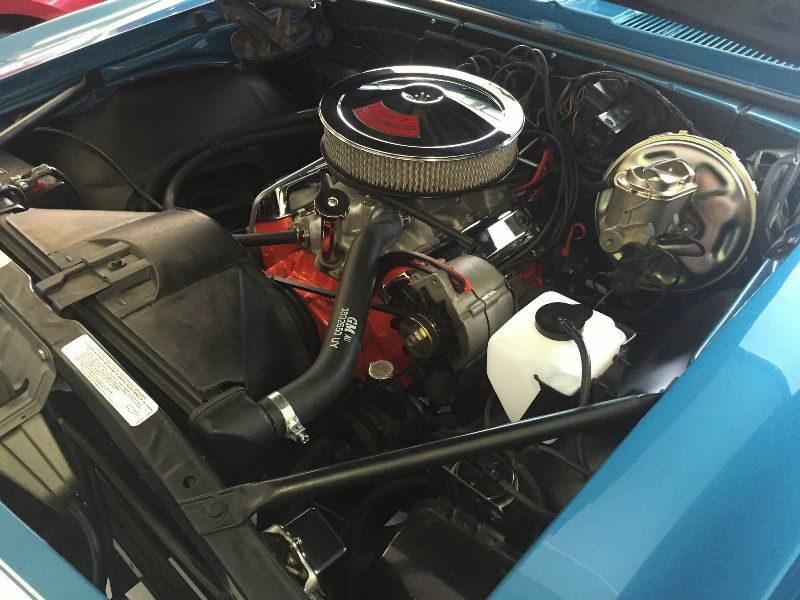 Dalton (CRG username camaroboy68ss) - Thanks for submitting your story and letting us learn more about your car!